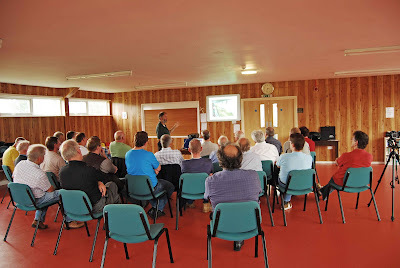 As the picture shows a good number of North East Group members turned out to hear what Iain Rice had to say on the subject of layout planning. We were treated to a slide show presentation with lots of comment along the way. I'm sure we all picked up a few hints and tips that will be of use to us in the future. I think it could easily have gone on for a lot longer but you know what happens when tea time approaches at a North East Meeting............... ! The empty chair belongs to the photographer. Thanks to Iain and all who made the day what it was.